The 2013 NFL Draft was widely panned as a disappointment by both fans and collectors. While it may have been a down year, several notable talents have emerged and Le'Veon Bell may end up being the best overall player from the rookie class. The explosive back for the Pittsburgh Steelers has been on a roll and Le'Veon Bell's rookie cards have the attention of the hobby. 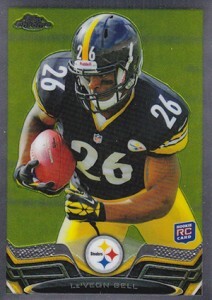 Shop for Le'Veon Bell cards on eBay. Before he reached the NFL, Le'Veon Bell had three good seasons for Michigan State. He capped his college career with nearly 1,800 rushing yards in his junior year and was named a First-team All-American and First-team All-Big Ten in 2012. Bell declared for the NFL Draft in 2013 and was selected 48th overall (2nd round) by the Pittsburgh Steelers. While Le'Veon Bell's rookie season was somewhat slowed by a preseason injury, he still put forth a productive year. Despite this, many questioned his long-term value in the league based on a plodding style and low rushing average. After dropping weight in the offseason following his rookie year, Bell showed how dynamic he could be and and has been one of the best overall running backs in the league in 2014. Things only got better for Bell in 2014 when his backup, LeGarrette Blount, was cut by the Steelers midway through the year. The all-purpose stud joined Walter Payton as the only running backs in NFL history to total three consecutive games with 200 or more yards from scrimmage. Collectors have nearly 40 options when it comes to Le'Veon Bell rookie cards and several more pre-rookie and college cards. Found in Panini and Topps products, the low and mid-level rookie card options are more plentiful, but there are still many signed cards that fall in the premium category. 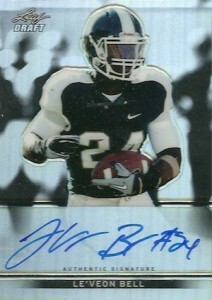 Among the rookie autographs, National Treasures and Five Star feature the most valuable rookies for Bell. Contenders and Inception are also very popular. If you are looking for a base offering, Topps Chrome, Finest, Prizm and flagship Topps all contain top budget rookie cards for Le'Veon Bell. Outside of the NFL-licensed cards, Upper Deck and Leaf offer popular first-year cards as well. Exquisite is the clear standout for these card, but anything with on-card autographs has seen good interest. Le'VEON BELL 2013 ROOKIE & STARS ROOKIE SLIDESHOW AUTOGRAPH #43 97 -STEELERS!! !